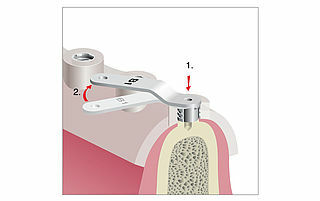 Pilot template for quick and simple positioning of the first drill hole irrespective of the implant system used. Full guided surgical template for using the BEGO Guide Trays for completely guided implant placement. All depth drills are guided, guided implant insertion possible. With residual dentition the template is simply supported by the remaining teeth. With tooth-supported gaps and free-ends, the template rests on the gingiva. For minimally invasive procedures. A scan prosthesis is required, transgingival drilling and insertion are possible. Should you not have your own planning software, the BEGO Guide planning centre can easily provide you with a plan and template. Should you have your own planning software, then this is the ideal prerequisite for the BEGO Guide System. As a rule your software is compatible with the BEGO Guide System. A list of the current systems can be found under "Planning systems". Guided surgery – simply simple! The BEGO Guide Trays facilitate the completely guided implantation of BEGO Semados® implants (S3.25-4.5, and RS/RSX 3.0-4.5). For the use of this tray you require a BEGO Guide drill template whose production is based on a three-dimensional, virtual implant plan and which is equipped with the BEGO Guide master sleeves. This type of template is available from a range of suppliers. You can find an up-to-date list of compatible systems here. If you do not use any 3D planning software yourself, our BEGO Guide planning centre will be happy to provide you with a proposed implant plan based on the CT or DVT data you can send to us online or on a CD and deliver you a ready-to-use BEGO Guide drill template. The BEGO Guide Trays offer you simple handling, which makes safe guided surgery simple for you. 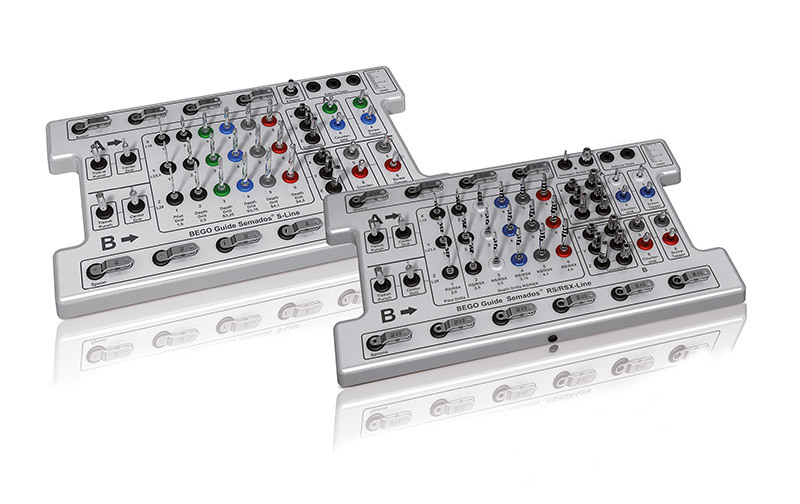 All the instruments can be quickly and intuitively assigned as the BEGO Guide Trays are clearly partitioned in two sections (A and B). Depending on which implant diameter is planned or which master sleeve is in the drill template, you will either require the instruments from the upper (A) or lower (B) section of the tray – only the depth drills are positioned between the two sections A and B in the tray. In addition, all the instruments are positioned in the order that they are used (from left to right) and labelled. This offers you added safety and optimal convenience during implant placement. A protocol of the respective drill template also provides you with support when choosing the instruments to use. This lists all the preparation steps in detail (step by step). Two hands instead of three: With the new BEGO technology – the self-locking BEGO Guide Spoons – completely guided implant placement is even more convenient. With this method, you do not need an additional hand to hold the reduction spoon, the BEGO Guide Spoon. Simply insert the BEGO Guide Spoons in the master sleeve (A or B) and lock them in place with a small twist. The BEGO Guide Spoons are now locked in the drill template and you can focus your full attention on the drilling. A small twist in the opposite direction is sufficient to unlock the spoons, allowing you to change to the next implant position quickly and conveniently. With the BEGO Guide Trays you don't have to tie yourself down to working with a specific guide system. 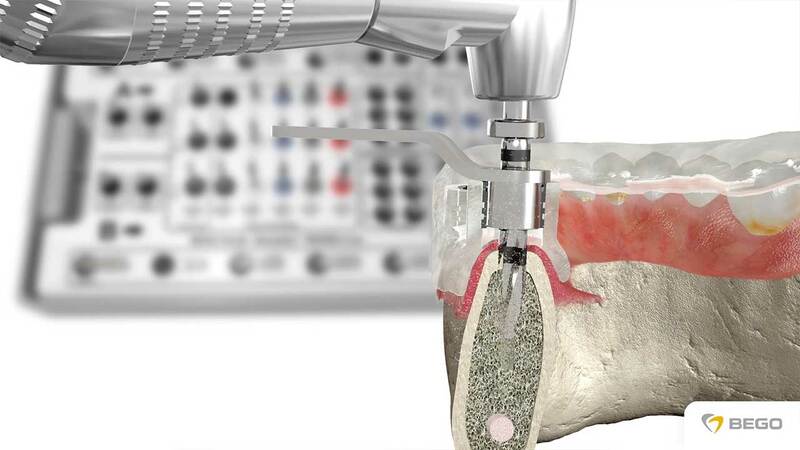 BEGO Implant Systems offers a range of planning system providers the possibility of implementing the BEGO Guide Trays in their respective software, so that you can continue to work with your favourite system. BEGO Guide Trays are already compatible with a wide range of different systems. You can find an up-to-date list here – or simply ask us about compatibility. Do you work with a laboratory-assisted planning system? This is not a problem either, as you can order the BEGO Guide master sleeves directly from us.